In breeze that built steadily as the day progressed, and with many classes recording a pair of races in ideal Caribbean sailing conditions, the action continued today with the traditional Saturday point-to-point contest to Marigot at the 33rd St Maarten Heineken Regatta. Following the morning's racing, for the first time ever, the race committee conducted an afternoon race for the 72 boats competing in the five Bareboat classes. 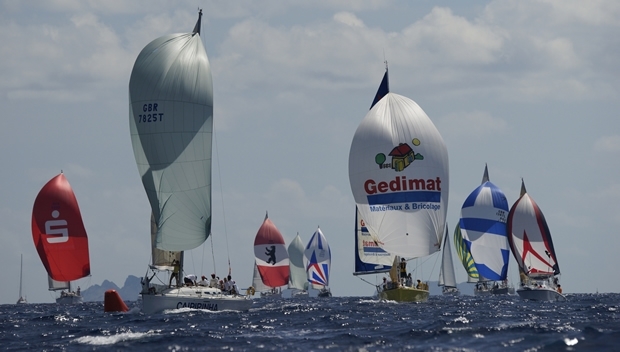 The CSA 2-8 divisions also sailed a second windward-leeward race in the Anguilla Channel. The fleet's larger yachts, in CSA 1, and Multihull 1 and 2, sailed a single race today, a 36 mile affair that took the sailors on a counterclockwise route around the island, leaving Tintamarre to port and embarking on a long reach to Blowing Rock off Anguilla before returning to the finish line off Marigot. All three starts for the big boats were colorful and spectacular. In Multihull 1, the Gunboat Elvis executed a picture perfect manoeuvre, rolling sistership Panthera to leeward as if she were standing still to take an early and substantial lead. In Multihull 2, Richard Woodridge's trimaran Triple Jack and Nils Erickson's fast cat Soma both rocketed off the line, resuming the close duel that began on Day 1 of the event. In CSA 1, all seven Grand Prix monohulls -a group that included the Swan 100, Varsovie; the 76ft IMS maxi Idea; and the IMOCA 60 Energa-were all on top of their respective games, hitting the line on time and with considerable pace. The other CSA classes sailed a 16 mile race from a starting line off Cole Bay to a finish off Marigot, followed by the afternoon round-the-buoys race. On the 'B Circle' for Bareboats, Multihull classes 3-5, and the Lottery Class, the morning race was a straightforward 8.5 mile sprint from a starting line south of Simpson Bay to Marigot. After lunch, the Bareboats reassembled for another eight mile race along the western shore of St. Maarten. The top Bareboats were extremely well sailed, with tight racing and sound tactics. Do not tell these crews they are charter sailors, and not full-fledged, competitive racing sailors. The crew of Extra Cold looked 'extra cool' in their orange uniforms. The all-women crews aboard Dutch@tack and Something Hot showed fine form running wing and wing down the coast of St Maarten in close-quarters racing during the morning race. Rom Gessel, the skipper of the Bareboat 2 entrant Neerlands Glorie, summed up the attitude prevalent among many of the Bareboat racers when the day was over: "We had one good race and one not-so-good race today," he said. "We sail with our friends, two are very good sailors, two are pretty good sailors, and the rest of the crew has not sailed much before. But they bring the fun, and that's why we come to the St Maarten Heineken Regatta. There is incredible competition in the bareboat classes, some very good teams. It's difficult to win. But it is always fun. And that is why we are here, and why we come back." When the results were tallied today, there were surprises across the fleet. In CSA 1, Daniel Stump's Lupa of London was today's winner, nipping Friday's top boat, Jan Rupert's Tripp 75 Blackbird. With three points apiece, Sunday's race in the big-boat class will be a winner-take-all showdown. In Multihull 1, Elvis' great start led to a second-straight victory. Multihull 2 remains wide open after Soma avenged her second-place finish on Friday with a win today, as Triple Jack took second, setting up another potential Sunday duel for all the marbles. In CSA 2, James Blackmore's Swan 53 Music rocketed to the top of the leaderboard by virtue of a pair of bullets on Saturday. CSA 3 is wide open: Greg Slyngstad's J/125 Hamachi has yet to win a race, but holds the lead thanks to a consistent series with no finish higher than sixth. When it comes to consistency, however, the crew of Han deBruyn Kops's Hanse 47 TeamHan is the very definition of the word-in three CSA 4 races so far, they've won all of them. Alain Riouallec's Bachi-Bouzouk, a Sigma 41, was twice a winner on Saturday and now holds a strong lead in CSA 5. The same goes for Lawrence Aqui's Wild T'ing, a Dufour 40, a two-time winner Saturday in CSA 6. With a 2-1 score today, Raphael Magras's X-34 Maelia leads CSA 7. And Mark Plaxton's Melges 32 Team INTAC has yet to lose a race thus far and is riding high in CSA 8. The battle between the Melges 24s will continue tomorrow, with Team Island Water World taking the lead after today's races and Team Budget Marine/Gill close behind them with only one point difference. For the second straight day, Petr Kochnev's Lagoon 500 Belisima won Multihull 3 to take a commanding lead. In Multihull 4, the Belize 43 Melisande won today's race, but is second overall behind the Outremer cat Teora, which registered a 1-2 in racing through Saturday. The Lottery Class leader remains Marc Perron's Jeanneau Sunfast 43, which followed up Friday's win with another on Saturday.